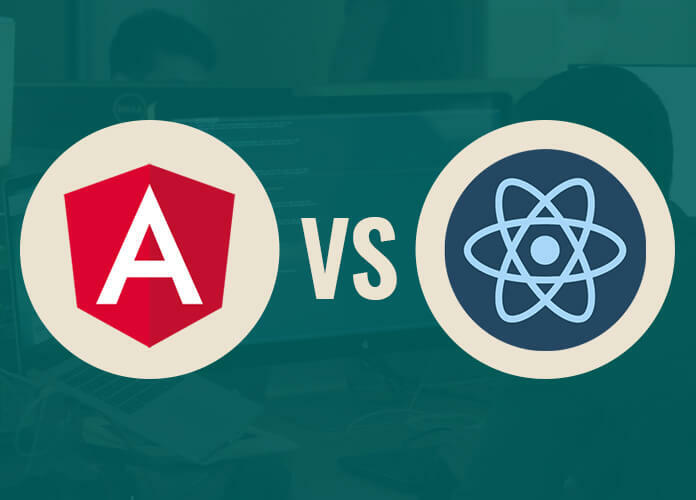 In this article, we are going to compare AngularJS, Angular 2 and ReactJS in order to outline the key differences between these two front-end technologies. ReactJS is an open source JS library rather than a classified framework. However, we can call AngularJS as a full-featured framework. There is a huge debate between these two frameworks for building front-end applications but unfortunately, there is no straight answer to which of them is the best framework to use. There are benefits and disadvantages of these two frameworks based on that you can decide which framework suits better for your needs. Architecture MVC (Model, View and controller). It obeys component based architecture. No architecture but it is combined with Flux. Data Binding Supports mutable data bindings i.e. Bi-directional data binding. Supports mutable data bindings i.e. Bi-directional data binding. Supports immutable data bindings i.e. Uni-directional data binding. Framework It is a Fully-featured MVC framework. It is a Fully-featured MVC framework. It is an open Source JS library. Packaging Weakly packaged. Medium Packaging. Strongly Packaged. 1. Scalability: – AngularJS has a powerful command line interface (CLI) and it is a very smartly designed framework that makes it very scalable as compared to ReactJS. ReactJS itself is testable and scalable as compared to the other frameworks such as Vue, etc. 2. Performance: – Both frameworks are known for their very good performances but both have different operational perspectives. For example, if we consider plain getters in Angular then they are out of the picture as they get called each time the render happens. Alternatively, we can use BehaviorSubject from RsJS which can serve the same purpose. Comparatively, ReactJS uses @computed from MobX which serves the same purpose and is known as one of the better API as compared to other available APIs. 3. DOM: – At the DOM level, ReactJS operates on the virtual DOM as compared to AngularJS which operates on the Regular DOM. The virtual DOM allows modifying only the selected part of the DOM which has actually changed but not the complete DOM. This feature of ReactJS saves times and delivers the better performance over Angular based applications. 4. Dependency Injection: – AngularJS and Angular2 support mutable data bindings whereas ReactJS is based on the principle of functional programming and immutability. ReactJS aids in decoupling as separate data-layer architecture is not present. Dependency injection is supported by Angular which makes it great when compared with ReactJS as it also supports working on different lifecycles for different stores. 5. Data Injection: – In Angular, the data is injected into directives through scopes. Scopes in Angular can be defined as an object that contains data for various controls such as controllers and directives. First of all, there is a root scope object which is present at the top level that can be accessed by all Angular components. Further, there are the controller’s scope and isolated scope (i.e. directive’s scope) where the former scope is used to inject the data into the later scope. The data bindings through scope can be done in the following three fashions. They are two way bindings, one way bindings and text bindings. On the other hand, in ReactJS the data is injected into its rendered views during the creation of the root or nested views (i.e. Construction time). The passed data is accessed through the prop property of the current context inside the class. Therefore, it just supports Uni-directional data binding only. 6. Event Handlers: – In Angular, the event handlers are assigned to the view portions through directives. Directives constitute the most of the Angular part e.g. the ng-click directive can hook the HTML element with the click handler present in the local scope. But in ReactJS, we need to setup various custom attributes on the HTML elements in order to make the event handlers work in the application which we are building by using ReactJS. 7. Loops: – Loops are supported by both Angular and ReactJS but in a different fashion. In Angular, looping can be done by simply using the built-in ng-repeat directive whereas, in ReactJS, we need to loop over various HTML elements by simply putting them into an array (i.e. JSX way of looping). 8. Simplicity & length of code: – Angular has a quite complex coding structure as compared to ReactJS which often causes confusion while building an application, especially when working with the 3rd party tools. ReactJS is quite simple to code but setting up the project to build an app may take a longer time as compared to AngularJS. Also, for a given functionality, the length of the code for AngularJS is often greater than ReactJS. This is because the Angular app requires a controller and an application to be built along with the definition of directives such as ng-app and ng-controller. 9. Model Complexity: – In AngularJS, we cannot use large models. Such a build has both benefits as well as disadvantages. The benefit is that the code becomes maintainable, simple, and testable but the disadvantage is that we need to break down the stuff which can be coded the normal way and need to rebuild it again. ReactJS supports complex models and it is up to the coder to make a choice between simple and complex model depending on the performance and development effort he wants to deliver and put respectively. In this article, we have compared AngularJS/2 vs ReactJS which are equally important, powerful and flexible frameworks. It is very hard to make a choice of use among these frameworks as each of them have their own benefits as well as disadvantages. Next, it depends on the programmer’s skills in JSX or Typescript (programming language) which may help further in making the choice of the framework in order to build a new front end web application.